NOTE: THIS IS THE SIT-STAND VERSION OF OUR I-BEAM DESK. For the more inexpensive, non-sit-stand version, please see my other listings. Also, be aware that the pictures in this listing are of the fixed height version. The sit/stand version has larger bases. 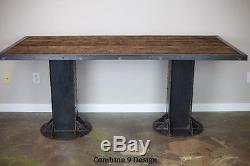 TO SEE THIS DESK IN ACTION YOU CAN VISIT, "Vintage/Modern Industrial Sit/Stand Desk by Combine9. If you sit at your desk for long periods of time (like most of us), there might be times that you'd like to take a break from sitting and work standing up. The problem, though, is that your desk height is designed for sitting. With this desk, you can simply push a button and have it raise to any height up to 43" high (most people find around 40" to 41 comfortable for standing). It's electric (standard AC power) and has 4 user-programmable heights. The lift mechanisms are capable of lifting a whopping 800 pounds, so like all my items, it's incredibly over-built and will last a long, long time. 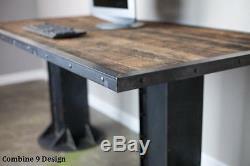 The design of the desk is fashioned after vintage bridges with their rivets and I-beams. As you can see, it's based on two heavy and incredibly industrial looking steel I-beams, and is chock full of rivets giving it a true vintage look. Adding to the character of this desk is the use of a reclaimed wood top. We have many different types of wood available to choose from. This desk is available in many different sizes and configurations, but the one pictured is 72"L X 32 3/4"D and the adjustable height has a range from 29" H to 43"H.
Many changes that can be made to its appearance include changing the number of rivets, a different top, four pedestals instead of two, add a return, etc.. The photos show the wood top left unsealed, but unless otherwise requested, they are now sealed. Once assembled the control module and touch panel can be easily attached. Everything will be marked and pre-drilled for your convenience. In addition to countless wonderful homeowners and small businesses around the country, some of our past clients include companies such as Disney, Google, Linked In, Living Social, Wyndham Hotels. Trip Advisor, Hard Rock Hotel & Casino, Vans Shoes, Vibram Shoes, Mishimoto, Starwood Hotels, and Bose retail stores. Weve also been in numerous national publications and TV shows including HGTVs House Hunters, a nation-wide Verizon TV commercial, a nation-wide Microsoft TV commercial, NBCs About a Boy TV show, Dwell (for their Dwell Labs exhibit), Sound & Vision magazine, Living Spaces magazine, etc. Weve even had several A-list celebrities (that weve been asked to not mention by name)! The patina is a chemical reaction and will be unique on each piece. TURNAROUND CAN VARY SIGNIFICANTLY FROM AS LITTLE AS A COUPLE WEEKS TO 5 OR MORE WEEKS (although it's rare that it's that long). We have many pieces in this and other styles. Please be sure to see my other items, and add me to your favorites list. We are frequently adding more pieces. My items are handmade in custom styles and sizes. They have been described as: Vintage, Industrial, Mid-Century, Modern, Urban, Loft décor, Steampunk (Steampunk), Metal Art, Futuristic, Futurama, furniture, bedroom, end table, night stand. Nightstand, storage, cabinet, dark, black, urban, modern, rustic, steel, patina. Living Room, Dining Room, Media Room, Family Room, Kitchen, Nature, Rust, Dining Table, Credenza, Entry way, Retail Fixture, Spa, Salon, Hotel, Restaurant, Barber, Office, Commercial, Business Furniture, Speaker Box, Speaker Cover, Media Console, Hallway, CNC, Durable, Rivets, Straps, Custom. Check out my other items. Be sure to add me to your favorites list. 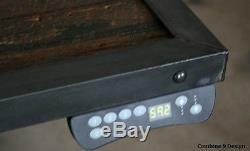 The item "Electric Sit Stand Desk. Urban" is in sale since Friday, January 31, 2014. 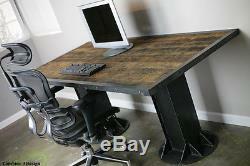 This item is in the category "Business & Industrial\Office\Office Furniture\Desks & Tables". The seller is "combine-9-design" and is located in Houston, Texas. This item can be shipped to United States.